A deep data dive into scripts shows the status quo is tough to change. The 2017 Emmy Awards, with the most diverse gathering ever of nominees and winners (look at all those women on stage!) proves one thing: The industry still has a long way to go. But there’s progress. 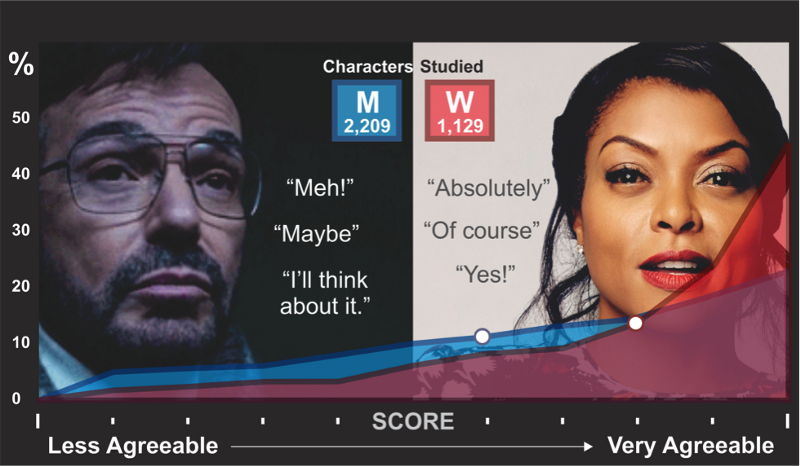 The data scientists StoryFit have been working on a gender-based character personality analysis in movie scripts using AI. 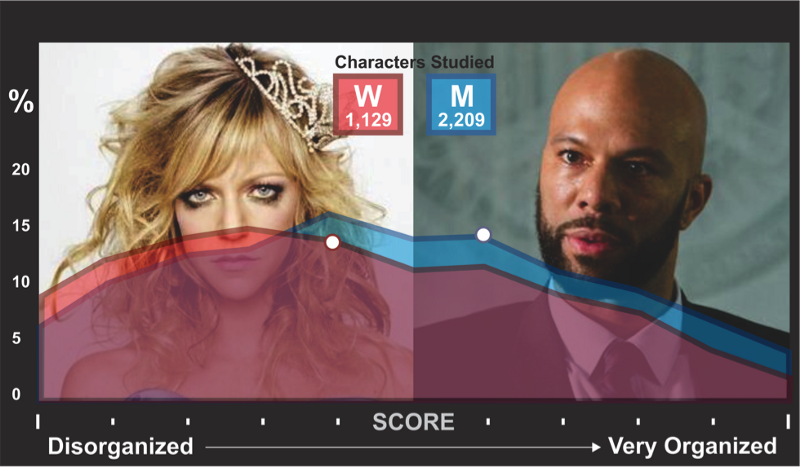 In light of the “Big Little Lies” cast comments this week, we couldn’t help but give a sneak peek at the forthcoming results, which will be fully published on October 16. The conversation about gender inequality in films has been going on for a while. We’re no longer surprised when reports demonstrate, with hard numbers, that female lead characters are fewer than male lead characters; that female characters, whether lead, supporting, or extra, have a cumulatively smaller (much smaller) percentage of dialogue than male characters. But beneath those numbers, there’s a wellspring of information: details about the kinds of characters, relationships, and plots audiences really want to see in films and TV shows. The details are in the data, and the data is in the scripts themselves. Last year we started looking into that data at StoryFit. Here’s one thing we discovered: Women exhibit a far more limited range of emotions than men.Of the five major emotions, women display either joy or sadness, with not much in between. At least that is how Hollywood is portraying the vast majority of women on screen. 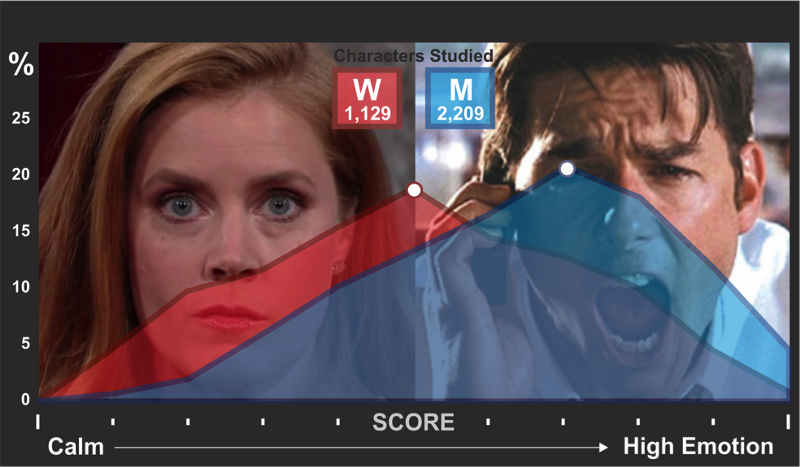 In the study, female characters displayed a shallower emotional range, on average. Male characters in the study exhibited deeper and stronger emotions. StoryFit™ technology employs AI (Artificial Intelligence) and NLP (Natural Language Processing) to examine the deep data inside these scripts. From blockbusters to flops, spanning the years 1928 to 2017, they hold information about character qualities, plot and actions to paint a detailed picture of audience preferences. Advances in NLP, machine learning and AI enable StoryFit™ to “read” a script and analyze it across many parameters. Multiply that process by more than a thousand, and strong patterns emerge. Male characters we studied weren’t always so agreeable. Female characters in the study were very, very agreeable. Other personality traits show differences between male and female characters: examination of the “conscientiousness” trait reveals that female characters are more likely to be messy and disorganized, while male characters are more likely to be type-A planners and day-savers. Would you hire these female characters to manage your investments or organize a rescue operation? Neither would we. These statistical differences tend to confirm negative stereotypes about women (and somewhat more positive stereotypes about men). When it comes to female film characters, audiences like agreeable women, and they actively dislike disagreeable women. So, where does all this insight lead us? Toward profitability for movies, for one thing. Because we also cross-analyze scripts based on their commercial and critical success, AI changes what we can know in advance about a script’s potential to become a blockbuster. For produced films, statistical analysis can reveal the cumulative effects of many decisions made over a long time, and help guide studios and producers’ early-stage choices. For example, in films that were commercially successful, those with female and male central characters who come across to the audience as angry were less likely to be profitable, but angry female characters (and disgusted female characters!) increased that likelihood. Conversely, movies with central female characters who were happy were more likely to be profitable. The more scripts we analyze, the more robust our statistical results. It’s like continuing to add detail to a scenic painting; the picture gradually becomes crystal-clear. And with an extensive database of past films, we’re able to make meaningful assessments of new scripts sent to us by studios making early investment decisions. Of course, the script is only one of many elements that go into making a film, which is still primarily a visual medium. But the power of film is undeniable, and the influence of films as the storytellers of our lives is immense. It’s worthwhile to take a long look at the causes and effects of our creative efforts. Data analysis can help us do it. Here’s another way to approach the data results: with an eye for opportunities for change. You know that audiences like what they like; the numbers are the numbers. But what if you think a particular script, one with a slightly different take on conventional characterization (or plot, or setting), could appeal to your audience, too? The data may show you a way to make that happen.